The BGI staff has extensive experience in the assessment of gemstones and jewellery, allowing different types of valuation to be determined. This can be of uncut or polished gems of different sorts, at either ‘Retail Replacement’ (usual) or market values as desired. Call and ask for a quote. 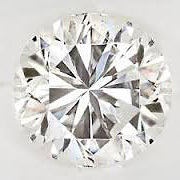 Since valuations automatically include both testing and grading as part of the service, certificates are not usually necessary for goods that are being valued by the BGI, but may act as a useful and vital form of extra ‘gem identification’ if the items are lost or stolen. The BGI is primarily concerned with establishing completely new and high levels of trust and consumer confidence. To this end we have developed an entirely new system of encrypted microchips that can revolutionise world trade. The AF (Anti-Fraud) POWERTAG is the name of this device, and we hope you will enjoy learning about its multiple uses in this field. The field of nanotechnology is one in which the BGI is a leading innovator with plans to offer simple but effective solutions to some of the world’s most demanding security problems, especially fraud and forms of theft and deception. The BGI has a dedicated team of legal and crime investigators who are committed to the detection, prevention and correcting of fraudulent transactions worldwide, and in rare cases the retrieval of lost assets. One example: a consumer reported an offer of gemstones worth US$1.2 million, reportedly with Swiss certification. We investigated and found the ‘gemstones’ were Fool’s Gold (Pyrites) worth £3, and there was no certificate after all! Watch out is the rule: if a gem is offered for sale, check it with BGI, whether ‘certificated’ or not. Even top laboratories can be incorrect, and a famously serious case was checked by BGI with a ‘sapphire’ having an HRD certificate saying only that. What was left out of that certificate was the nature of the stone, which BGI tested with LA-ICPMS, which stands for ‘laser ablation inductively-coupled plasma mass spectrometry’, and found the stone to be a synthetic. BGI contacted HRD, the Diamond High Council of Belgium, and suggested they compensate the buyer, but they declined. The mere fact HRD had issued a certificate at all implied to the buyer that they had ‘passed’ the item, but this impression was incorrect. The certificate’s small print had allowed the purchase without showing the laboratory was to blame in any legal way. That item was bought in Turkey, but beware of any purchase outside the UK, and if within the UK, make sure it is described as ‘natural’, to avoid buying a synthetic one with little or no actual value. Caution is always advised. BGI is still the world’s only laboratory to split each letter colour grade into 100 separate parts, so we would always advise a BGI certificate to be sure. 1) ALTERED GEMS AND DAMAGED JEWELLERY: many of the cases brought to the BGI laboratory for forensic examination and hopefully resolution, involve pieces of jewellery that have sustained damage. Often a customer may find damage on an item, and feel convinced it was there from new. Although this is of course possible, it is rarely the truth found on closer examination. In one case, two claws had come loose from the collet (metal section/part that holds the stone) and threatened to loose the stone. Luckily it was still there, and the ring could be checked by microscope to see if the soldered joints of those claws had ever been attached properly to their mounting. VERDICT: they had been correctly attached. Both loose claws, seen under the intense beam of a fibre optic light made especially for the BGI laboratory, showed these 2 claws had been subjected to a force at an oblique angle, leaving the other 2 intact, and clear fracture lines where the solder was still fixed to the claw sides: clear evidence of force after the making of the ring. 2) UNIQUE EMERALDS. One special examination was carried out on the security of a mine with a rare type of gem found in only one location to date, namely in one place in western America, high in the Rockies of Utah. Mine security is a complex problem best solved by hiring a very honest workforce so far as that is possible, but the finding of a type of traditionally green emerald that had all the same crystal habits and formation but for one thing: due to the presence of manganese in the melt of the metamorphic rock in which the crystals grew, the absorption meant that the crystals were red in natural light. 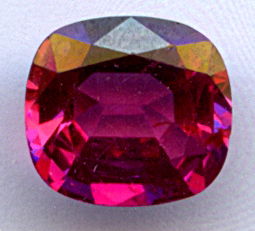 With the gem’s atomic structure absorbing blue and green light from the white light entering it, the result was unique: a red emerald (bixbite). 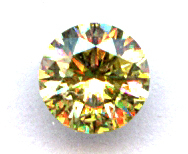 Actually nearly all emeralds show some or a lot of red colouring when viewed through a green light filter (the Chelsea Colour Filter is useful, a good gemmological tool), which allows the eye to see the red that is masked by the stronger green, caused by the presence of chromium in the atomic lattice. 3) IDENTIFYING SLIGHTLY OR VERY ODD GEMS: The BGI lab was lucky to see one very odd gem, which was both blue and green at the same time. On testing, the results showed it to be emerald, but since this beautiful gem can also be bright red, and had not ever been recorded in these mixed shades with blue, a full examination was launched. The gems had a higher than average RI index, but the inclusions under the intense fibre optic lights of the lab systems showed emerald signatures that seemed conclusive. Yet how was this colour to be accepted as natural? 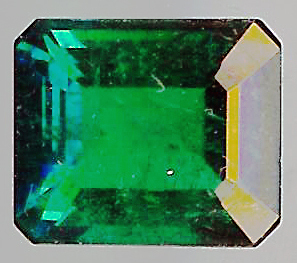 Coming from Tanzania from a known source, the indications were that this could indeed be a new colour of emerald, but that is so unlikely to be true that other tests were made to confirm. Another expert was shown the material and doubts were raised about its origin, and then an academic laboratory in Scotland made further tests and decided it was indeed natural, and indeed a new emerald colour form. 4) A STRANGE BLUE GEM. 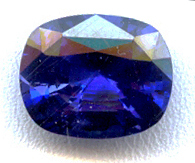 One gem sent in was a strange blue colour, not like the characteristic paler (usually but not always) blue of Sri Lankan sapphires, nor the darker blue of Thai stones, the high iron content of which masks any effect under UV light. But there was a key: under the UV lamp at long wave was a bright blue fluorescence that showed the gem must be chemically very different from these, and it was. A series of other tests including RI, came up with a result that many people have still not heard of. VERDICT: Spinel. [You may wonder what on earth spinel is, and where the name derives from, and the answer is from the Latin word spina meaning thorn, because of its pointed octahedral (8 sided) crystals (see 5). BGI GEMMOLOGICAL SCIENCE DETAIL: These interesting doubly terminated shapes are so sharp in form that ‘thorn’ was the name given, and this in turn gave rise to the 16th Century French word spinelle, from which we get spinel. Fluorite looks similar with this same crystal habit, but is much softer at 4 on the Mohs scale (steel is 6.5). Spinel has a chemical formula MgAl2O4, and forms an ‘isomorphous series’ rather like corundum. In spinel’s case this is where iron (Fe), zinc (Zn) or manganese (Mn) may replace the magnesium (Mg) shown in the formula, and this causes differences in light absorption of the spectrum of white light, ‘taking out’ certain colours (wavelengths) and thus creating the colours red or blue and even clear, mainly. 5) NEW MINERAL DISCOVERY WITH GEM POTENTIAL: In 2005 the BGI was asked by insurance underwriters to check the identity of a special type of gem form. The fine details remain confidential to the owners, but our tests showed that they really had discovered a new type of gemstone. 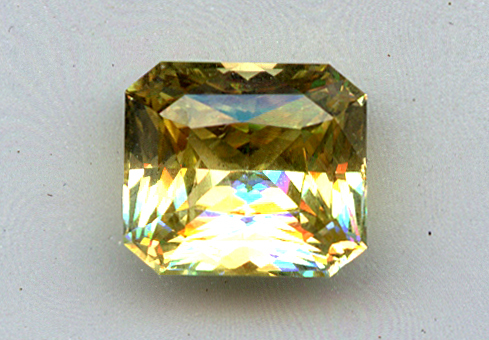 The gem value was the key question to be solved in this case [based on whether this material was indeed a new gemstone or not]. The test results were positive, and the value of the samples was high, so details of that find will certainly be released to the press in due course.